Having trouble falling asleep? Using coconut oil, olive oil, beeswax, and essential oils, you can easily concoct your own DIY, nice-smelling sleep salve that will help you drift off to slumber with minimal effort. Simply heat together 1 cup coconut oil, 1 cup olive oil, and 4 tablespoons grated beeswax in a glass bowl placed in a double boiler until everything is melted together. Add 50 drops each of lavender, orange, cedar wood, peppermint, and cinnamon essential oils to the mixture. Transport mixture into a glass jar until it cools at room temperature. 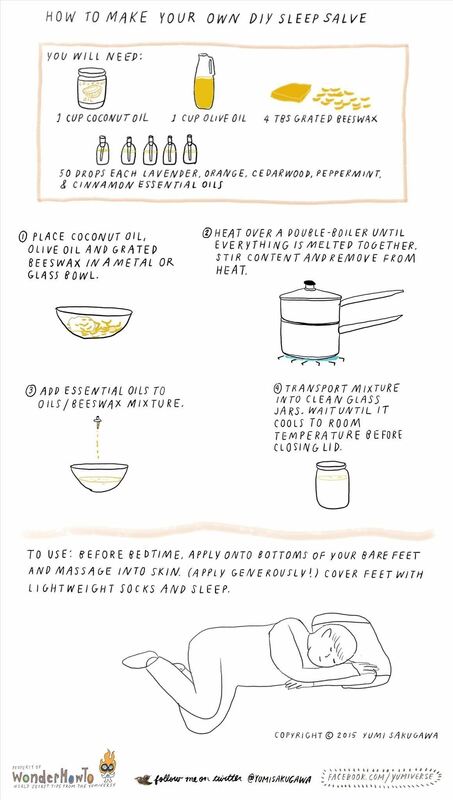 Once the concoction has solidified to a salve, you can apply it to your feet at night and cover them with lightweight socks. I really must try this.